Today I was asked where I would recommend going to buy reasonably priced mid-century furniture, particularly chairs. My answer is that it really depends on how much time you want to dedicate to searching the markets and trade fairs and if you are willing to take day off to go hunting around the country. To some people this might sounds like a fun day out and well worth the investment to find that unique special piece to others it might sound like an awful lot of effort just to find something to sit on. My answer is in two parts, firstly for those in search of the perfect piece at a bargain price then rent a van for the day and head to one of the larger antique fairs. www.antiques-atlas.com gives a great listing of which days the fairs are being held and where, you can also use this site to source pieces from individual dealers or just track down where the best markets are binge held. If budget is not an issue and you want to stay closer to home, then a Saturday spend roaming around Alfie’s market on Church street is always a pleasure and you’ll be sure to find some beautiful pieces. Another must in London is Lots road auctions which brings together an array of furniture and decorative items in their weekly afternoon auctions. Secondly, the world of antiques and furniture traders may lag behind a little in terms of keeping ahead with technology, but you would be surprised at just how many dealers are using online websites to trade on. My advice is to find a dealer that stocks pieces you like and if you don’t find what you are looking for in their advertised stock list give them a call. It takes an awful lot of time to upload images and details, so much of the time smaller dealers will have many more items that are not shown on their site or sometimes they may offer to keep an eye out while doing the trade fair rounds for the piece you want. This can save you an awful lot of time and effort. In the past I have taken the train over to Brussels for the weekend in search for something just a little more interesting. Most dealers will arrange shipping back to England and the prices are such that in some (not all) cases its more than worth it. The Flea markets are a great place to pick up a bargain too. 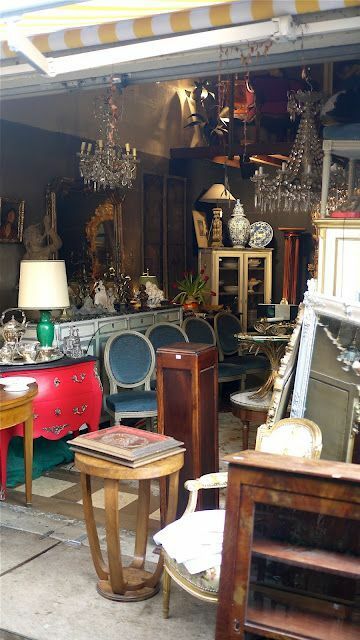 Check out Galerie des Minimes and the Marolles Flea Market. Paris is a fantastic place to pick up something chic without breaking the bank but usually will be a little pricier than Its neighbours in Brussels. Head to Saint-Ouen north norger superb of Paris with its many markets and you won’t be disappointed.